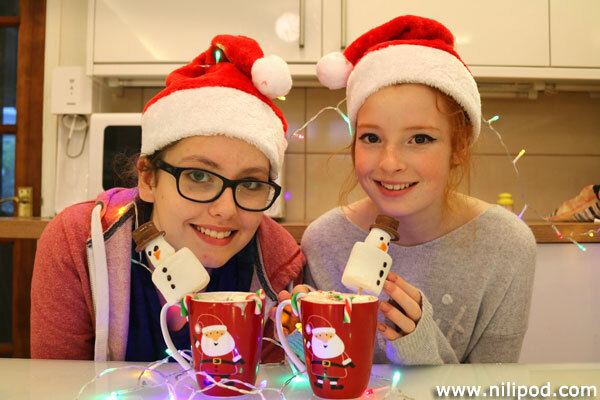 Well, we both love hot chocolate, and we both love Christmas, so it seemed really very sensible to combine the two and make some festive hot chocolates with marshmallow snowmen sitting on top of a mountain of spray cream 'snow'. These drinks are actually very, very easy to make, but they look incredibly impressive when you see them for the first time, and they are of course rather delicious to drink and eat. To make these, we recommend that you use a spoonful of hot chocolate powder, a spoonful of cocoa powder, and some full-fat milk. Mix the powders with a little milk and warm this for 30 seconds to a minute in the microwave, mixing this to make sure that all of the lumps vanish and properly combine with the milk. Then, top the mug up with the rest of the milk and warm for another 90 seconds (ish) in the microwave. In the meantime, get a wooden skewer and spear large and small white marshmallow sweets to create the body and head of the snowmen. We piped on some eyes, an orange triangular 'carrot nose', and buttons on the front, using coloured icing, and made the top hat from different sizes of round Christmas chocolate coins, hanging some small candy canes from the side of the mugs for that little bit of extra seasonal cheer and sweetness. Of note, we have made a YouTube video of this 'recipe'.